Flipping through the latest issue of Men’s Health I found a mention to a study from University of Pennsylvania which showed that LDL cholesterol levels could be lowered by roughly 21 percent by supplementing daily with red yeast rice or by simply adding the rice to your normal recipies. "The Natural Statin – There may now be an all-natural (and less expensive) alternative to statins. 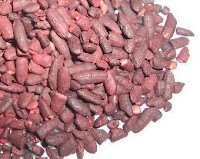 University of Pennsylvania researchers discovered that people who took 1,800 mg of red yeast rice supplements twice a day for six months saw their LDL cholesterol levels drop 21 percent. That’s nearly the same reduction seen with many statins, but minus the muscle soreness those drugs can sometimes cause. If you’re on statins but want to explore a different option, ask your heart doctor about switching to Naturals Red Yeast Rice the same brand used in the study." It’s funny I was just talking with a colleague about the benefits of statins and how they seem to be taking the medical field by storm. In many circles they are being touted as the next miracle drug, right up there with aspirin. Previously I quoted Dr. William Castelli from the Framingham Heart Study who said that close to 90 percent of coronary death could be prevented with controlling cholesterol being at the top of his list. Of course stains do just that, but coupling their use with positive changes to your diet surely makes them work better. I’m not advocating going off statins if you are already on them, but I do believe that both diet and lifestyle choices cannot be forgotten in the treatment of and prevention of disease. Adding quality foods to your diet which have been shown to maintain health should be made a priority. Previously I touted the positive effects of simply eating more plant sterols to lower LDL cholesterol levels. This finding on red yeast rice might be one additional measure which should be considered in cholesterol management. And if your not into supplementing you can always seek to get the natural stuff form the food you eat as well. It is rice after all and if you can find it in stores you can substitute it for regular white or brown rice with no changes. In addition to statins and red yeast rice, I would encourage you to look into the many other methods of lowering your LDL cholesterol levels through the food you eat. Here is an article on how to lower LDL Cholesterol Levels with better nutrition, which has a nice rundown of many additional ideas for you to explore.